In this paper the authors reflect upon their experiences of doctoral study as they reached critical points in the development of their research projects. Developing previous considerations surrounding philosophical identity, the authors draw upon their respective experiences of engagement with the taught components of a professional Doctorate in Education and explore, through autobiographical narratives as illuminated by the critical incidents and events along the way, those elements that have led to changes in both goal orientation and professional identity. Specific examples are cited which demonstrate the effect on learning of course-based assignments and other submissions which track the authors' journeys on the course. In conclusion, the authors advance their revised philosophical positions and offer useful insights into the processing of knowledge within a professional doctoral programme. Engaging with a doctorate and generating knowledge has been suggested as a learning process which involves ‘breakthroughs, leaps and crossings’ that might produce nudges leading to sustainable transformations in learning development (Wisker et al. 2010: p. 50). Similarly, Meyer and Land (2003) refer to threshold concepts, which describe the actions and or events necessary for the development of subject specific understanding. Wisker et al. (2010) however develop the threshold concept idea by focusing specifically on the research-related learning which develops during the stages of doctoral study, and refer instead to conceptual threshold crossing. This development emphasises both doctoral level study and the more general stages of learning which enable understanding and progression in the doctoral context. Here, we refer to doctoral study within the context of an educational doctorate (EdD) which emphasises the development of professional knowledge within a framework of both taught and personal research-based components, usually alongside professional commitments. According to Trafford and Leshem (2009, p. 311), when understanding is achieved research students ‘can demonstrate that they are thinking like a researcher’. Described in another way, the experience of engagement might be viewed as ‘transformative’ and reflect a shift from ‘knowledge dissemination to dialogic interaction’ (Kim, 2004: p. 81). Transformation involves both the development of specific knowledge located in the professional doctoral student’s field of interest and the transformation of their identity (Barnacle and Mewburn, 2010). Identity development appears to form a key aspect of the doctoral student’s eventual success, both in completing the doctorate and entering a new phase of research and scholarship (Barnacle and Mewburn, 2010; Wisker et al. 2010). However it is often not clear when and how learning thresholds advance developments in expertise. Thus we set out to identify the transformative processes and events which contributed to knowledge development and the development of our philosophical identities. We compare experiences from two diverse disciplines, with Ross specialising in corporate finance and Adrian in engineering and technology. In this paper we address the key research question: how did our breakthroughs, leaps and crossings contribute to transformation and identity and how did these differ during our respective doctoral learning journeys? We first define our understanding of goal orientation, learning and philosophical identity and outline the methodology employed in data collection. Then, our autobiographical accounts are presented, which draw upon evidence from our experiences of the educational doctorate. Finally we discuss the similarities and differences presented by the evidence and how our respective goal orientations and philosophical identities have evolved accordingly. A conclusion outlines the key issues which emerge from this research and suggests areas for further study. Our stories explore the events which have affected decisions leading to alterations in research goals during a period of three years spent engaging with a professional doctorate in education. We draw on the critical incident technique (Flanagan, 1954; Schluter, Seaton and Chaboyer, 2008) to illustrate the development of goal orientation and the formulation of research intensions. The term research goal is used to describe the topic and direction of research which contributes to the final thesis element of the professional doctorate. Events include a number of critical incidents, including the first consideration of a research study described in our course applications, assignments and working documents such as research registration and ethics applications, which contributed to developing research intensions. We engage a key principle, that change and development in one’s goals and beliefs represents learning which can be identified in relation to critical incidents and the actors involved. This might be termed learning within a community of practice (Lave and Wenger, 1991) and can be shown to draw on both personal endeavour and the interaction between actors (Vygotsky, 1978), including other students on the course and the supervisors of assignments. We conceive of learning in this context as the engagement with what Bruner (1977, p. 49) terms ‘learning episodes’, consisting of ‘processes’ including: the acquisition of new knowledge (complementing or replacing existing knowledge), transformation (new knowledge is manipulated, analysed, synthesised or converted to another form) and evaluation (verification of new knowledge against its application to check generalisation and question plausibility). The learning episode conception is thus used as an analytical framework when considering learning within course-based events and the episodes are represented by focal points in the learning journeys outlined below. Our chosen methodological approach combines use of the autobiographical narrative (Goodson, 2013) with the critical incident technique (Flanagan, 1954). We operationalise this approach via the analysis of personal diaries and documents relating to the taught components and assignment stages (assessment feedback, tutor correspondence) of the first three years of a five year EdD. These were chosen as representations of specific episodes in our respective learning journeys and because they allowed comparisons between these specific events. We draw upon our autobiographical narratives which explore experience, meaning and the resultant change manifested in goal orientation and philosophical identity. Our stories evolve from the EdD experience and context and together begin to reveal what Goodson (2013, p. 6) refers to as ‘life history’ reflecting a ‘pattern of social relations, interactions and historical constructions’. We see our reflections fitting Goodson’s (2013, p. 12) concept of ‘small narrative’, which tend to be ‘highly individualized [and] special interest narratives’ and which may hold some ‘narrative capital’ (ibid, p. 14) in their ability to explain our learning journeys. Through our narratives, experiences are captured using the critical incident technique (CIT). Flanagan (1954, p. 327) describes the CIT as ‘a set of procedures for collecting direct observations of human behaviour’. Specifically the technique requires a focus upon extreme, revelatory or transformative incidents which may be identified using methods such as personal diaries, accounts and portfolios (Norman et al. 1992). Our narratives are analysed using the learning episode taxonomy. We compare key events on our doctoral journeys using the three learning processes: acquisition, transformation and evaluation. These narratives are then ‘elaborated’, where through discussion we move our life stories closer to life history enabling us to jointly exploit possibilities for ‘understanding how time and context impinge on peoples’ lives’ (Goodson, 2006: p. 15). The following questions are of particular interest to us as two learners from diverse disciplinary fields: what are the common patterns of learning which can be identified in our course-based activities? And how have these impacted our research intentions and doctoral identities? First, Ross’s story is presented; then Adrian presents his story, also through a number of learning episodes and events. These are then compared in a discussion of narratives and learning journeys in the following section. Like many professional doctorate students (Burgess, Sieminski and Arthur, 2006), my original research intensions were anchored in a practice-based focus. Specifically, my research application articulated the intention to investigate the concept of graduate employability in my own area of professional practice: accountancy and using quantitative methodology. My doctoral journey, as will now be discussed, involved a major reformation of this goal orientation. My philosophical position has also changed as a result. Like Adrian, my story utilises Bruner’s learning processes (Bruner, 1977) and explores how each of these (acquisitive, transformational and evaluative) have impacted my goal orientations and philosophical identity since embarking on the EdD. A major critical incident that can be related to Bruner’s conception of an acquisitive episode occurred during the taught Researching the Real World 2 component assignment which involved researching and drafting a research proposal including a more replete exploration of the literatures pertaining to methodological and methods’ choices. This investigation enabled me to appreciate the critical role of qualitative research where multiple realities, stakeholder interpretations and researcher bias are both present and important. I therefore began to question the legitimacy of quantitative approaches as a sole methodological basis for my own proposal. This doubt was fuelled by my reflecting upon practice experiences between 1985 and 2001. Specifically, recalling the Enron (Nordberg, 2014) accounting scandals caused me to question the reliability of accounting information, the historical acceptance of there being a ‘right way’ to present accounting information and the tendency for the various accounting actors to interpret information differently. This critical incident on Researching the Real World 2 caused me to consider linkages (Bruner, 1977) with other learning experiences and previously acquired knowledge. The correlative nature of these two events therefore presented me with a strong argument to abandon my pre-conceived goal orientations and to consider exploring alternatives. My second critical incident can be compared to Bruner’s transformative episodic process. The precise event concerned a tutorial on the Preparing Your Research Proposal Module. This event was a socially anchored critical incident in that involved personal feedback from academic staff. At this tutorial, the construction of my proposed doctoral research methodology was scrutinised and questioned on two fronts. Firstly, my tutors called into question the viability of my sampling frame, suggesting that it was both too big and homogeneous. Secondly, and relatedly, they expressed concern whether my doctoral investigation could produce generalisable results. This prompted me to reflect on my research question and the practicalities of doctoral study. My study being exploratory in nature, would surely be much better suited to focusing in-depth upon individual interpretations of a more narrowly delineated context? I had limited resources available to me which militated against an ambitious study design. This incident conveyed many important messages to me in the early part of my doctoral journey. Firstly, it identified the power of social incidents as a catalyst for reflective and revisionist thinking. It also proffered the prompt to engage in a transformative process. It was the social and personalised nature of the incident, which shone a light on my own research plans and illuminated the latent arguments for a change of direction. What happens if I get this one wrong? This is going to an important committee – I cannot displease them? The symbolism of this evaluation motivated me to stress-test my previously acquired knowledge stock. As a result, I made several revisions to my original proposal in the areas of: method triangulation; data protection; and the incorporation of a mixed-method design frame. My goal orientations have therefore been influenced by social and non-social incidents. These events have precipitated reflection upon both action (Schon, 1987) and practice, allowing me to envisage linkages between knowledge stock items (synthesis) and to evaluate their potential contributions in the doctoral assessments. Furthermore, my third critical incident, suggests that symbolically important events may heighten the appetite to engage in transformative and evaluative thinking. My philosophical leanings have similarly been influenced and moulded by a series of trigger points leading to the wholesale refocussing of my position. My secondary and tertiary educational background incorporated immersion in scientific disciplines; indeed, it was in subjects such as mathematics and geology that I produced my highest levels of attainment. My early career trajectory into the accounting profession was underpinned by this scientific educational bias which dovetailed neatly with the demands of working in accountancy. Philosophically, this engendered a degree of comfort with positivism; I was comfortable with tasks involving logic and law-like generalisations which neatly satisfied the requirements of my profession. I was neither trained to question dogma or to consider alternative approaches to my work. The Enron collapse and the subsequent criticisms levelled towards the audit profession in its wake (Norberg, 2014) altered my viewpoint however. This incident caused me to question the sanctity and veracity of accounting dogma. I also reasoned that accounting information could be interpreted (and to an extent, manipulated) differently by various stakeholders. Enron also coincided with me leaving the profession and becoming an accounting lecturer. My initial experiences of academe fuelled more suspicion of the scientific primacy in accounting and of positivism as an appropriate philosophical position. It became obvious that my students were learning and interpreting accounting information in different ways, questioning dogma and accounting principles. At this point in my career I was therefore becoming more receptive to the merits of interpretivism. I therefore commenced my studies on the EdD with a leaning towards the positivist paradigm but with some lingering doubts. Whilst studying the introductory research methods module, I encountered further philosophical positions: principally interpretivism, postmodernism and critical theory. It was the latter theory that resonated with me. My studies caused me to reflect upon the power structures, biases and the role of gatekeeping within the accounting profession. I conjectured that entering the profession may indeed be controlled by certain societal groups who dictate a relatively narrow range of entry criteria that may simultaneously advantage and disadvantage some demographic groups. The attraction of critical theory then presented itself to me. To a certain extent, flirtation with postmodernism and critical thinking in the early stages of a doctoral study is to be expected (Thomas, 2013); in many ways it is a natural by-product of the high level of critical thinking required to progress. In my case it served as a critical incident causing me to foreground the role of power and bias in understanding the economy and society. Such was the significance of this incident, that my proposal was reframed accordingly. My experiences in Year 2 of the EdD helped to cement a virtual rejection of the positivist paradigm in my own research field. This can be explained by two events. I strongly perceived that the philosophical leanings of my own Doctoral tutors were also aligned to interpretivism, postmodernism and critical theory. The net effect was to help confirm and validate my own thinking which was by now orientating towards a near permanent rejection of positivism. Secondly, the Writing for Academic Practice module entailed a full exploration of the concepts of reflection and critical thinking (Bolton, 2012; Schon, 1987). Hitherto I retained only a working understanding of these concepts, now I began to explore the underpinning theory, science and principles. The effect was to sharpen my own critical thinking skills; I became ‘omnicritical’. I was constantly seeking to challenge the veracity and credibility of facts, statements and arguments and not just in my studies: there was a spill over into my own personal life and I found myself becoming increasingly sceptical of news reports and media articles. The concept of universal truth now appeared remote and further reinforced my fermenting dissatisfaction with positivism, the abandonment of grand narratives (Thomas, 2013) and the desire to more fully explore the role of power and praxis. Year three of the doctoral programme injected urgency and immediacy into my thinking owing to the proximity of doctoral completion. There were several critical incidents that helped to propagate these feelings. During the year, I was required to submit two highly important and symbolic documents: the proposal registration document and the application for ethical approval. Firstly, they confirmed the looming proximity of the thesis stage and down the line, completion of the doctorate. Secondly, and more significantly, I became more instrumental in my progression strategy. Because of this ‘thesis creep’ realisation, my orientations altered. The reflection upon my philosophical leanings was scaled back and replaced by a sense of practical and pragmatic thinking. The onus shifted towards finding a methodology that proffered the best chance of doctoral success. This change of thinking was also fuelled by the outcomes of a series of meetings with my supervisory team. At these meetings a consistent and valid criticism of my proposed study began to emerge: the scope of my study was simply too broad and radical alterations were required in my sampling frame and research questions. These criticisms, whilst not directly related to philosophy, helped me to become more strategic and practical in my research design. The impact of these critical incidents experienced in year three were to guide me towards the merits of pragmatism; I jettisoned some of my passion towards antipositivism in favour of a more ‘can do’ approach that involved matching philosophy and methodology to the research questions. However, was I now open to the charge of ‘philosophical selling out’? Fortunately, despite my emerging pragmatic stance, I maintained an interpretivist philosophical position in my proposed thesis coupled with a qualitative methodology. This research framework is not however the result of my passion for a particular philosophical position but the result of pragmatism (the philosophy and methodology most appropriately match the demands of the research questions). Drawing on writing produced for the course application, I note that my original research intention was to explore learning through creativity, with a view to developing and using a data collection tool following the type discussed by Torrance (2003). There were strong links with MA study, which investigated cognitive ability testing and its role within Technology education. My overarching goal, to explore further the characteristics that contribute to knowledge and understanding in Technology education, did not changed significantly; the topic and vehicle used to achieve that goal, however, underwent several revisions. The following discussion explores my EdD learning experience in relation to Bruner’s (1977) learning processes and locates that learning in relation to the self and interaction with others. These considerations are then discussed in relation to a previous examination of philosophical identity (Thompson and Twissell, 2012), a revision of that position and the implications of change on developing research intentions. Berger and Luckmann (1984, 37) describe the ‘reality of everyday life’, where consciousness, experience and routines form reality and are ‘taken for granted as reality’ (emphasis in original). Recognising this relationship between value, experience and feeling, Berger and Luckmann (1984, 13) propose that reality is ‘socially constructed’ and socially context specific, therefore suggesting that reality and knowledge are actor and culture dependent (Twissell, 2012a). I realised at this early point in the course, as evidenced by this assignment extract, that social context and the multiple realities and perspectives attached to research settings render the research endeavour more complex than MA study had revealed. It led to a revision of research intensions because I realised that incongruence arises between the experimental approach related to creativity testing and my professional experience of education, which suggested that creativity tests may tell us something about an individual’s ability to answer test questions, but are less informative about teaching or learning in practice. Thus theoretical perspectives acquired during the module raised awareness of underlying epistemological considerations and stimulated change accordingly. Transformation describes Bruner’s (1977) contention that knowledge requires manipulation, analysis or conversion to stimulate learning. This process can be linked with the first opportunity to present my research intensions, in the form of the research registration application. The process brought together the acquisition of knowledge from the taught component Learning and Teaching, teaching experience and feedback from peers. It focused the research topic around spatial visualisation strategies as a development of my creativity interest. A critical incident within this transformation process is represented by the ‘Preparation for Registration Meeting’ (Haight, 2013) and reveals an unresolved issue; although I could make clear links between visualisation strategies and their use within my chosen focus area of electronics education, I was unable to define a precise research question. The opportunity to discuss this with knowledgeable others (ibid) helped to clarify intensions by widening my thinking and potential for developing research intensions. Further acquisition, in the form of additional reading, clarified the focus as the translation of, and transition between, visual representations in the development of conceptual understanding. This now offered a framework within which to develop an appropriate methodology and method of exploring students’ engagement with different electronics based representations. Bruner’s (1977) transformation stage can be identified in the production of the registration application, which clearly articulated what was being researched, why and how. This was a good indication that my research intensions appeared well grounded in and supported by the theory. Thus evaluating the plausibility of the proposal led to a revised approach which considered much more rigorously the multiple perspectives and influences of the research context. My original intension, to explore further the characteristics that contribute to knowledge and understanding in Technology education, remained, but my approach and the types of data that would be collected, were the subject of significant revision. In summary, Bruner’s (1977) acquisition and transformation stages appear to be strongly grounded in personal endeavour. Conversely evaluation appears to emerge from the engagement of others in reflection-on-action (Schon, 1987) following those acquisition and transformation incidents. Social engagement, as Vygotsky (1978) conceptualised with the zone of proximal development, appears key to the evaluation and revision of intensions and may manifest itself in one-to-one discussion, group discussion and peer or assessor feedback. Previously (Thompson and Twissell, 2012) I described my philosophical identity as postmodernist, having explored my transitional journey, from professional practise to a career in education, in comparison and conjunction with a peer’s similar experience. Evidence from assignments also supports this early position. For example in Researching the Real World 2, although promoting the benefits of interpretivism and mixed methods, I grounded my proposal for future research in the exploration of creativity using testing and quantitative methods. In the following I highlight critical incidents which overlap and interweave with those described above and demonstrate a development of a postmodernist position. Reflecting on three further critical incidents from the EdD experience, I illustrate an emerging pattern which represents a concern for the practical aspects of inquiry. The three incidents emerge from: the Registration Document, the Ethics Application and the module Advanced Research Methods. These incidents can be shown to influence philosophical identity and develop the position reached by Thompson and Twissell (2012) and that reflected in early assignments, such as Researching the Real World 2, where I continued a strong affiliation with a postmodernist stance through the methodology suggested in a research methods critique. This project is underpinned by constructivist theories of learning and emphasises the socio-cultural perspective offered by the rich meaning that can be obtained from contexts involving participation in the real world and interactions between participants in educational settings’ (Twissell, 2013b: p. 3). Thus a concern for both interpretivism and the pragmatics of inquiry with participants in educational settings emerged. This concern is dichotomous with that reflected in earlier work, such as Researching the Real World 2 and might be attributed to a growing concern to ground my research in ‘what’s possible’ within my own educational setting and a growing realisation and support for constructivist theories. Drawing on the registration document, the Ethics application developed constructivism further. Here I note ‘The study will involve recording Year 10 students’ engagement with two lessons designed to reveal the use of representations and the different ways students construct understanding using these representations’ and ‘Through the analysis of student/student and student/teacher dialogue and focus-group interviews, it is hoped that a description of students’ understanding can be developed’ (Twissell, 2014a). This reveals a concern for the student as ‘owner’ and ‘generator of knowledge’, and reinforces an interpretivist position with pragmatic characteristics linked to context. Finally the taught component Advanced Research Methods (Presentation) feedback supported my choice of interpretivism and pragmatism. Chosen methodology and methods were here compared with alternatives, which offered an opportunity to finally evaluate intensions and confirm my approach, whilst gaining support from peer review following presentation. In addition to mapping the development of philosophical identity, this exploration has highlighted the sequential nature of thinking, which begins broadly with a concern for the topic of research and progresses towards the pragmatics of execution. My stance can be seen to evolve as thinking about the topic revolves around practical matters and finally manifests itself in the acceptance of pragmatism as a result of that thinking. In this context, practical matters are reflected in a growing acceptance that educational research needs to reflect that which is credible and trustworthy and is unlikely to be widely generalizable in the context of a small-scale study. We set out to identify our transformative learning processes and events, as revealed through our specific EdD experiences. We wanted to explore when and how these learning experiences impacted on research intention and identity. Mapping our respective critical incidents using Bruner’s (1977) episodes has revealed a common stage approach to stimulating change (Figure 1). Whilst we take slightly different approaches to presenting our stories (e.g., Adrian presents extracts from his assignments, where Ross alternatively tends to draw out his experience through discussion), we have both arrived at similar conclusions about the nature of our learning on the basis of specific transformative learning stages, irrespective of our differing disciplinary affiliations. These stages involved a combination of personal endeavour and exposure within our ‘zones’ of learning where critical others, including peers and course supervisors, influenced the decision making process. These factors might be considered to represent a community of practice (Lave and Wenger, 1991) within which learning is a reflexive process. Thus academic endeavour and exposure to knowledge acquisition opportunities, we believe, represents an awareness raising stage. Manipulating and converting this new knowledge (transformation) has led to the creation and synthesis of ideas, what Wisker et al. (2010, p. 6) refer to as an ‘epistemological shift’. Finally, reflection on those ideas (evaluation) has led us to alter the orientation of research goals and our philosophical identities, referred to as an ‘ontological shift’ (ibid). Drawing from these learning stages, we highlight four outcomes emerging from our comparisons of course experiences, as presented in the preceding narratives. Firstly we concur with Wisker et al.’s (2010) notion that there exist more general conceptual thresholds which are crossed during the learning journey. For example both Ross and Adrian identify with the social aspects of learning, Adrian highlighting a realisation relating to the contextual aspects of research early in the course and Ross highlighting stakeholder interpretation and researcher bias as significant influences. There is also an inference early within Adrian’s narrative (i.e., comparison with MA study) that EdD study promotes a more self-critical stance and Ross’s story also provides evidence of self-reflection which occurred as a result of EdD study (i.e., reflection on accounting practice and merits of qualitative research). Secondly, we concur that our specific learning stages have become symbolic for us, in that we attach meaning to those symbols, aligning them with the process of ‘crossing’ the various thresholds. However the meaning attributed to each symbol is necessarily personally nuanced (e.g., social learning as a symbolic event is on the one hand context bound (Adrian) and on the other hand (Ross) actor dependent). These symbols might be considered ‘key’ or ‘pivotal’ (Turner, 1975: p. 146) within a transformative process. To take another example, Ross found that it was the formality symbolised by the Ethics Committee’s report that precipitated his reflective and evaluative thinking regarding reformulating the research proposal. Adrian found that discursive exchange with peers and supervisors symbolised the reflection necessary to reformulate his approach within his intended research setting. Thirdly, unlike the traditional PhD which has been described as a ‘largely individual’ endeavour (Scott and Morrison, 2010: p. 18), our professional doctorate experiences have demonstrated that the learning journey is not in isolation. Instead, social exchange has been key to our progression. Drawing on Meyer and Land (2003) our interpretation of ‘bounded’ thresholds relates to the boundaries that are opened up through negotiation and exchange with others engaging in the doctoral journey and therefore we support the notion that knowledge is socially constructed and socially mediated (Bruner, 1977; Vygotsky, 1978). Fourthly drawing on Wisker et al. (2010, p. 6), we identify a common move towards pragmatism which represents an ‘ontological shift’ in thinking and a transition point in our doctoral conceptual threshold crossing. 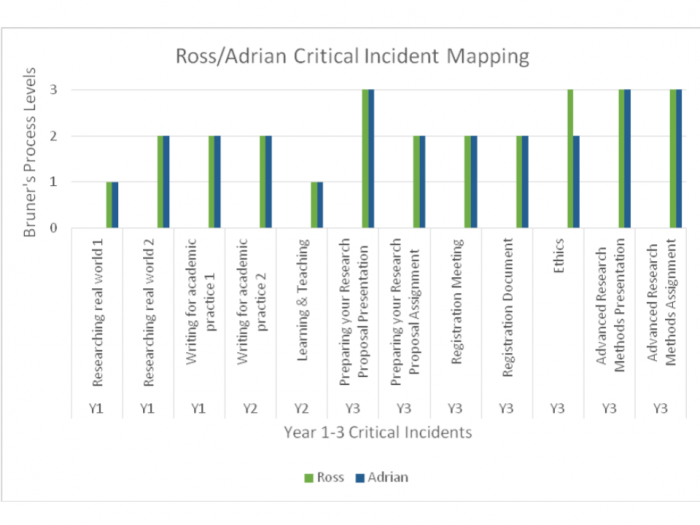 This is manifested in a growing concern, compounded by the incidents described in our research, to make decisions and act upon them; a concern to ‘get on with the job’, but also a reflection of the need for compliance with institutional procedure and time scales (e.g., Ross eludes to ‘fermented urgency’ and doctoral completion, Adrian to ‘what’s possible’ in relation to his educational setting). There is evidence that this emerging orientation towards pragmatism might be time bound. It is clear that both Adrian and Ross arrived at this paradigmatic position having first thoroughly considered and explored other standpoints (Thompson and Twissell, 2012). There is also a suggestion that both doctoral students embraced a degree of realism and a can-do attitude as the doctoral journey developed. Could it be that the closer the completion date becomes, the more instrumental the student is prone to become? We have drawn on Flanagan’s (1954) critical incident technique and its more recent developments (Schluter et al. 2008) as a basis for exploring our experiences of a professional doctorate in education. We suggest, as a development of our research, an evaluation of the approach we adopted based on Flanagan’s (1954) five steps to using the critical incident technique. The technique, and our research, may be strengthened by its scrutiny through the lenses of those five steps, as follows: identifying aims, identification of types of events, data collection, data analysis and project dissemination. At the same time, widening the scope of autobiographical narrative data collection to other professional doctorate students would extend the possibilities for further and more detailed analysis of doctoral experiences. This paper locates the experiences of two professional doctorate students within a discussion about learning, evolving goal orientation and philosophical identity. We present, through autobiographical narrative, a number of critical incidents as symbolic events, which led to changes in thinking about a future research study and our learning on a professional doctorate in education programme. We found that breakthroughs, leaps and crossings were associated with transformations in the knowledge and understanding emergent from specific learning events. These incidents may be brigaded into either social exchange events (e.g., peer review or assignment feedback) or non-social events (e.g., knowledge development and adjustments in philosophical identity). The emphasis on social exchange, considered to be a key feature of our learning, may be an important distinction when comparing learning on a traditional PhD with that experienced following an EdD course. Our common experiences also suggest that the close links between academic development, professional contexts and the research endeavour may lead to a pragmatic approach to inquiry and the decision making process. The role of critical incidents may therefore be of interest to potential doctoral researchers as they provide an insight into when and how learning develops in relation to the Bruner taxonomy, and how this applies to a doctoral journey as it unfolds alongside professional commitments. The experiences of Adrian and Ross indicate that whilst the doctoral journey is largely a relatively slow and incremental one, it is also marked by significant step advancements of knowledge, its transformation and evaluation. Our experiences further suggest that these steps are frequently pre-empted by certain key critical incidents. These incidents mark the thresholds traversed, and reflect advancements in knowledge and expertise. Our individual journeys also reinforce the need to acquire a suitably replete and relevant knowledge stock as a precursor for transformation and evaluation. Insufficient levels of knowledge accumulation may therefore render the critical incidents inadequate as catalysts of step advancement in knowledge and its application. Taken together, these observations may characterise a particular type of learning to be found on a professional doctorate programme and which may be absent from traditionally conceived PhDs. Our notions of professional doctoral identity appear to revolve around flexibility, change, negotiation, compliance and implementation. Through these characteristics, we argue, we can show that our doctoral identities have undergone a shift in emphasis, a shift which hopefully indicates that we have started to understand the ‘complexities’ of research and begun to ‘think like a researcher’ (Trafford and Lesham, 2009: p. 311). Barnacle, R. and Mewburn, I. (2010) Learning networks and the journeys of ‘becoming doctor’, Studies in Higher Education, 35 (4), 433-444. Berger, P. L. and Luckmann, T. (1984) The Social Construction of Reality: A Treatise in the Sociology of Knowledge, London: Pelican. Bolton, G. (2013) Reflective Practice (ed. 3), London: Sage. Bruner, J. (1977) The Process of Education, Cambridge, Massachusetts: Harvard University Press. Burgess, H., Sieminski, S. and Arthur, L. (2006) Achieving your doctorate in education, London: Sage. Flanagan, J. C. (1954) The Critical Incident Technique, Psychological Bulletin, 51 (4), 327-358. Goodson, I. (2006) The rise of life history narratives, Teacher Education Quarterly, 33 (4), 7-21. Goodson, I. (2013) Developing narrative theory: Life histories and personal representation, Abingdon, UK: Routledge. Haight, A. (2013) Preparing your Research Proposal (meeting), Module P72007, Oxford Brookes University, 19th July. Kim, Y. J. (2004) Finding Dialogic Curricula: A Transformative Journey through Doctoral Studies, Curriculum and Teaching Dialogue, 6 (2), 81-88. Lave, J. and Wenger, E. (1991) Situated learning: Legitimate peripheral participation. Cambridge: Cambridge University Press. McGregor, D. (2014) (Chair) Preparing your Research Proposal (Presentation), Module P72007, Oxford Brookes University, 15th February. Meyer, J. H. F. and Land, R. (2003) Threshold concepts and troublesome knowledge: Linkages to ways of thinking and practising within the disciplines, (Occasional Report No. 4). Swindon, UK: TLRP/ESRC. Norman, I. J., Redfern, S. J., Tomalin, D. A. and Oliver, S. (1992) Developing Flanagan’s critical incident technique to elicit indicators of high and low quality nursing care from patients and their nurses. Journal of Advanced Nursing, 17 (1), 590–600. Schluter, J., Seaton, P. and Chaboyer, W. (2008) Critical incident technique: A user’s guide for nurse researchers, Journal of Advanced Nursing, 61 (1), 107-114. Schon, D. (1987) Educating the Reflective Practitioner, London: Jossey-Bass.Scott, D. and Morrison, M. (2010) New sites and agents for research education in the United Kingdom: Making and taking doctoral identities, Work Based Learning e-Journal, 1 (1), 15-34. Thompson, R. and Twissell, A. (2012) Philosophy, research and occupational setting: Two doctoral students reflect upon how their differing occupational experiences have influenced philosophical identity. In Brown, E. and Wright, A. Education Reflections, Oxford Brookes University, School of Education Conference, 13th July. Torrance, P. E. (2003) The New Millennium: A Time for Looking Forward and Looking Back, The Journal of Secondary Gifted Education, 15 (1), 6-12. Trafford, V. and Leshem, S. (2009) Doctorateness as a threshold concept, Innovations in Education and Teaching International, 46 (3), 305-316. Turner, V. (1975) Symbolic studies, Annual Review of Anthropology, 4, 145-161. Twissell, A. (2012a) Philosophy of Education: personal and professional perspectives, Researching the Real World 1 Assignment Module P72001, Oxford Brookes University, Submission deadline 23rd January. Twissell, A. (2013b) Registration Document, Oxford Brookes University, Submitted 10th November. Twissell, A. (2014a) Ethics Application, Oxford Brookes University, Submitted 7th May. Vygotsky, L. S. (1978) Mind In Society, Cambridge, MA: Harvard University Press. Wisker, G., Morris, C., Cheng, M., Warnes, M., Trafford, V., Robinson, G. and Lilly, J. (2010) Doctoral Learning Journeys: Final Report, Higher Education Academy National Teaching Fellowship Scheme Project, University of Brighton and Anglia Ruskin University. Ross is currently a professional doctoral student and Senior Lecturer in Corporate Finance at Southampton Solent University. His research interests are focused upon graduate employability and the importance of identity and real options within the employability process. He holds a first degree in physical geography from Lancaster University and postgraduate business degrees from the Universities of Portsmouth and Manchester. Adrian is Head of Engineering, Design and Technology at Aylesbury Grammar School. His specialisms include electronics and applied technology. Adrian’s research interests are focused upon the use of visual representations in support of students’ learning strategies and their development of abstract concepts in applied skills education. Adrian completed his Doctorate in Education at Oxford Brookes University in 2016. His thesis explored mental representation and the use of mental models in support of learners’ concept development. A taxonomy of learning strategies emerged from a qualitative cross-comparative case study.